George Clausen’s oeuvre is hugely diverse in style, but unwavering in its sensitivity and effective technique. Clausen was enormously inspired by the countryside, and turned to painting genre scenes and portraits of ordinary land workers. This drawing is likely to be a preparatory sketch for a painting such as this. 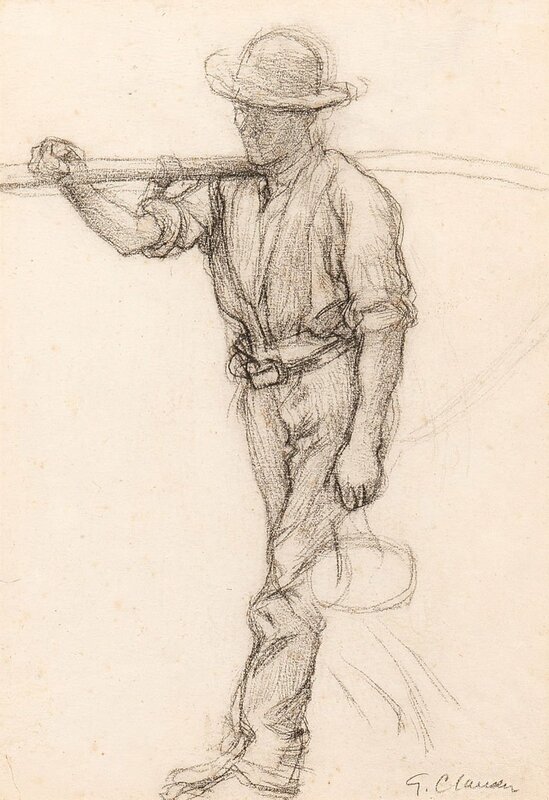 It depicts a farm hand walking, mid stride, with a scythe over one shoulder. The liberal way in which the figure has been drawn implies that the artist may in fact have been working from life. Images such as this one served to illustrate the gruelling nature of rural work before mechanisation of farming practices. These pictures are removed from the idealised, saccharine Victorian paintings of Clausen’s predecessors, and depict rural life in a touchingly sombre manner, whilst maintaining a heightened sense of realism. In this way, Clausen followed in the footsteps of Gustave Courbet, the first French artist to make a departure from the city ideals of country people’s experience; and paint the poverty and hardship of their lives. Clausen was born in London in 1852, his mother was Scottish and his father was from Denmark. Clausen’s father was artistically minded, and was employed as an interior decorator. Clausen at first followed in his father’s trade but in 1867 began to attend evening classes at the National Art School, which is now the Royal College of Art, in South Kensington. There he studied under the painter Edwin Long and it was Long who convinced the younger painter to pursue art as a full time career. In 1875 Clausen travelled to Holland and Belgium where he became influenced by Dutch naturalism. 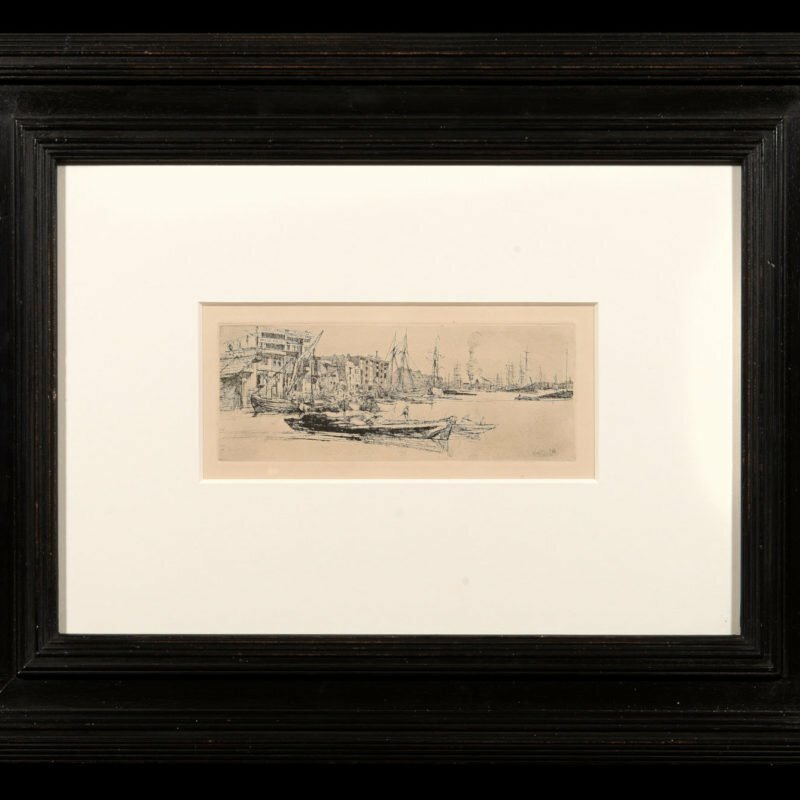 In 1881, he married Agnes Webster and the couple lived in Berkshire where the surrounding countryside provided the artist with rural inspiration for his work. In 1882 Clausen left for France where he studied briefly at the Académie Julien, Paris. While there, he visited the studios of French Salon painters, including Clus-Duran. In France Clausen became interested in the out-of-doors realism of Juels Bastien-Lepage. On return to England, Clausen formed the New English Art Club in 1886 which adhered to the French style of painting en-plein-air. The artist was elected ARA in 1895 and RA in 1908. From 1903-6 he was appointed to the position of Professor of Painting at the Royal Academy. He received many honours during his lifetime. In 1893 Clausen was awarded an honorary membership in the Art Workers Guild and during World War I he served as an official war artist. In 1927 he was knighted.